"MGM Grand Hotel and Casino" redirects here. For the current MGM Grand hotel, see MGM Grand Las Vegas. Bally's Las Vegas, formerly the MGM Grand Hotel and Casino, is a hotel and casino on the Las Vegas Strip in Paradise, Nevada, owned and operated by Caesars Entertainment. The hotel features 2,814 extra-sized guestrooms that are 450 sq ft (42 m2) or larger and over 175,000 sq ft (16,300 m2) of banquet and meeting space. The casino occupies 67,000 sq ft (6,200 m2). About 75% of the rooms are in the Indigo Tower, and were renovated in 2004. The remaining rooms are located in the Jubilee Tower, constructed in 1981. The resort has a large shopping area a floor below its gaming level, including several restaurants, and there is a station along the Las Vegas Monorail at the rear of the property. Bally's was home for the long-running production show Jubilee! which opened in 1981 and ended on February 11, 2016. On November 21, 1980, the hotel, then operating as the MGM Grand, was the site of one of the worst high-rise fires in United States history, in which 87 people died. The 43 acres (17 ha) site was first occupied by the Three Coins Motel, which opened in 1963. The Bonanza Hotel and Casino opened on the site in July 1967. It was later renamed the New Bonanza Hotel and Casino in 1973 shortly before construction of the MGM Grand Hotel and Casino, owned by Kirk Kerkorian, began. It opened in 1973 with 2,084 rooms for the then-staggering cost of $106m and was the largest hotel in the world at that time, and larger than the Empire State Building. The MGM Grand opened as one of Las Vegas's first megaresorts on December 5, 1973. Dean Martin was the entertainer on opening night. It was the largest hotel in the world at its opening and would remain so for several years. When the hotel was built, it set a new standard of size and luxury in Las Vegas, and is considered to have made the biggest impact on Las Vegas until the construction of Steve Wynn's Mirage Hotel in the late 1980s. The hotel had a movie theme to reflect Kirk Kerkorian's interest in movies from his ownership of MGM and the hotel's use of MGM in its name. The hotel was designed by architect Martin Stern, Jr. It featured many amenities, including numerous entertainment options. It offered live jai alai for betting and a large shopping arcade with numerous shops and restaurants. It was also one of the Strip's most popular entertainment destinations. It featured two large theaters: The Ziegfeld Stage and the Celebrity Room. The Ziegfeld regularly featured productions by famed Las Vegas choreographer Donn Arden including the long running Jubilee! and Hallelujah Hollywood. Dean Martin was the starring act for the Grand Opening on December 23, 1973. Sergio Franchi was the first entertainer signed to star in the Celebrity Room (three-year contract starting February 1974). Franchi's frequent co-star was comedian Joan Rivers. The Celebrity Room also hosted such acts as The Carpenters and Barry Manilow. The Dean Martin Celebrity Roast shows were filmed at the hotel. On November 21, 1980 the MGM Grand suffered a fire that started in a casino restaurant and traveled up into the hotel, killing 87 guests and employees. The Grand was rebuilt in only eight months, and remodeling added a tower which opened in 1981. The tower had been under construction at the time of the fire, but remained undamaged. The fire made such an impact on hotel safety that it led to the implementation of fire safety improvements worldwide. 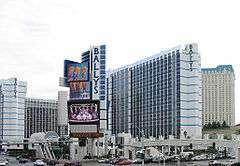 The hotel was sold in 1986 to Bally Manufacturing for $594m, and the property's name was changed to Bally's (the MGM Grand name was transferred to the former Marina Hotel, now known as MGM Grand Las Vegas). Bally Entertainment was purchased in 1995 by Hilton Hotels Corporation. On April 17, 1997, ground was broken on a sister property, Paris Las Vegas. In September 1999, the new resort was opened and tightly integrated with Bally's property by a promenade. For many years, the two resorts operated under a single gaming license. Hilton's casino resorts division was subsequently spun off and became Caesars Entertainment, Inc. in 2003. The hotel's North tower was renovated in 2004. Harrah's Entertainment (now Caesars Entertainment Corporation) acquired the property with its purchase of Caesars in June 2005. Caesars Entertainment announced in Spring 2013 that they were going to fully renovate the South tower and rename it "Jubilee" Tower by the end of 2013. The name is inspired by their "Jubilee!" production show. Hosted The Dean Martin Celebrity Roast in the Ziegfeld Room from 1974 to 1984. Featured in the 1985 film Rocky IV, as the site of Apollo Creed's exhibition bout against Ivan Drago. The theater, and set pieces, for Jubilee! are prominently displayed during the scene. Featured in the 1985 film Fever Pitch, evidently when the sale of the casino was pending. Featured in the 1992 film Honeymoon in Vegas, starring Nicolas Cage and Sarah Jessica Parker. Featured prominently in the 1995 film Leaving Las Vegas, also starring Cage and Elisabeth Shue. Featured in the 2004 video game Grand Theft Auto: San Andreas as the "High Roller". Bally's Las Vegas hosted Spike TV's 2006 poker tournament series King of Vegas. Featured in the 2013 film The Incredible Burt Wonderstone, starring Steve Carell and Steve Buscemi. Bally's Las Vegas hosted the second season of the 2015 syndicated game show Monopoly Millionaires' Club. A head chef position at BLT Steak, located inside the hotel, will be awarded to the winner of Hell's Kitchen's 15th season. ↑ "List of Las Vegas hotel fires through the years". Las Vegas Sun. Retrieved 2016-11-07. ↑ The Dallas Morning News. August 21, 1973. Dallas, Tex. ↑ "Harrah's Empire News". vegastodayandtomorrow.com. Retrieved 2008-03-31.